Homo floresiensis was a one metre tall, human-like creature living and using tools in Indonesia just 18 000 years ago and was a distinct species, not just a malformed modern human. The so-called hobbit had wrist bones almost identical to those found in early hominins and modern chimpanzees, and so must have diverged from the human lineage well before modern humans and Neanderthals arose. Liang Bua is a limestone cave on Flores, in eastern Indonesia, in which Homo floresiensis skeletons were found. They reported the discovery of a new species of human, one that lived as recently as 12 000 years ago, at the same time as modern humans. "We know that Homo floresiensis was, in Flores at least, from 100 000 years ago to about 12 000 years ago. And at that time, or at least from 40 000 years ago, we had modern humans in Asia and New Guinea and Australia. Resin cast of the skull and lower jaw of the "Hobbit", donated to the UNE library by Professor Peter Brown. Artist's impression of what the "Hobbit" may have looked like. Examples of tools from the shaft at Liang Bua, donated by Mark Moore. An international team of paleoanthropologists, anatomists and archeologists, led by William L. Jungers, of Stony Brook University, have published the first scientific analysis of the foot of Homo floresiensis, the fossil found in Indonesia in 2003 and popularly referred to as the "Hobbit". Their findings are reported in the May 7 issue of Nature. Newswise — An international team of paleoanthropologists, anatomists and archeologists have published the first scientific analysis of the foot of Homo floresiensis, the fossil found in Indonesia in 2003 and popularly referred to as the "Hobbit". Lead author William L. Jungers of Stony Brook University, and colleagues documented the Hobbit’s unusual combination of ape-like and human-like foot features, which clearly enabled bipedal walking, a hallmark of all humans and their extinct relatives (hominins), despite its surprisingly primitive design. Their findings, reported in the May 7 issue of Nature, provide further evidence that the ancestor of this species was perhaps not Homo erectus but instead another more primitive and remote hominin. 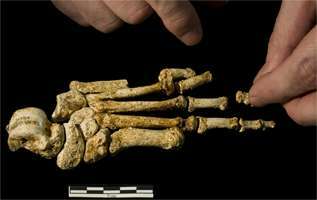 The authors point out that the Hobbit foot has a relative foot length that far exceeds the upper limits for modern humans either of average or short stature. The foot is similar in relative length to pygmy chimpanzees, with long and curved toes, but also sports a short big toe in line with the other toes. While the foot has an overall structure that signals bipedal walking, it appears to have been "flat-footed" and poorly designed for running, one of the critical pedal features believed to characterize human ancesters since the time of Homo erectus. 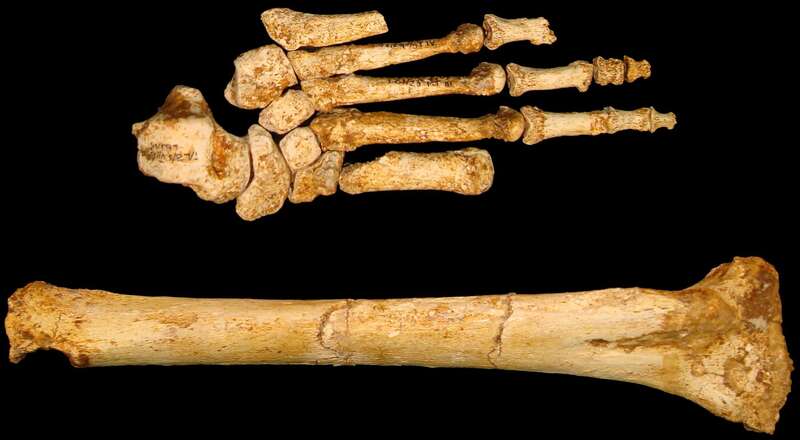 "A foot like this one has never been seen before in the human fossil record," says Dr. Jungers, Distinguished Teaching Professor and Chair of the Department of Anatomical Sciences at Stony Brook. "Our analysis offers the most complete glimpse to date of how a primitive bipedal foot was designed and differed from that of later hominins and modern humans." "Arches are the hallmark of a modern human foot," explains co-author Dr. William E. H. Harcourt-Smith of the American Museum of Natural History. "This is another strong piece of the evidence that the 'hobbit' was not like us." In "The foot of Homo floresiensis," the authors also suggest that despite these feet being dated to the Late Pleistocene age (17 000 years ago), their features together with many other parts of the Homo floresiensis skeleton, might represent the primitive condition for our own genus Homo. This could imply a dispersal event out of Africa earlier than what paleoanthropologists have long thought. "These particular 'hobbit' feet may have never walked into Mordor, but they certainly remind us how little we know about which other hominin species walked out of Africa and the many possible places their feet helped take them," adds co-author Dr. Matthew Tocheri, of the Smithsonian Institution. Dr. Jungers points out that "if the feet and skeleton of the 'hobbits' are instead the result of 'island dwarfing' from the Southeast Asian Homo erectus as some scientists suspect, then an amazing number of evolutionary reversals to primitive conditions had to occur as an unexplained and unprecedented by-product." 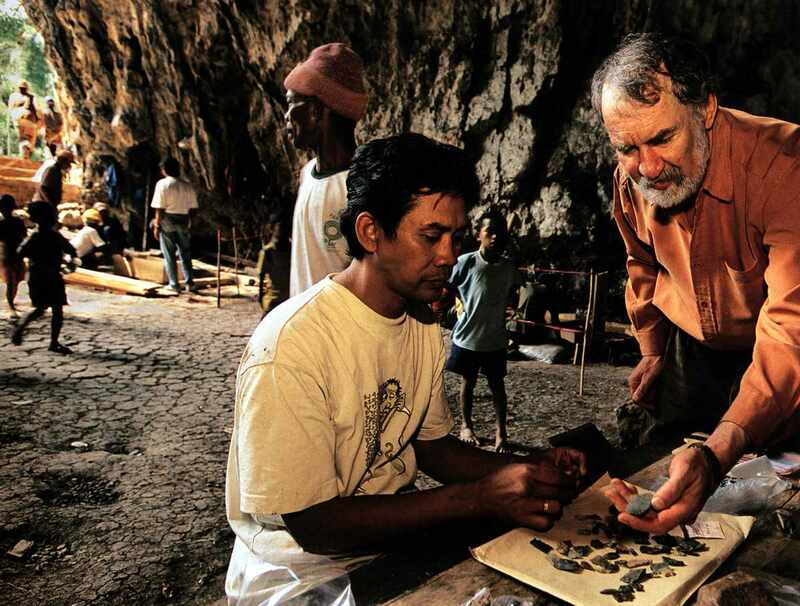 Continued excavations on Flores and other parts of Indonesia, to be led by co-author Dr. Mike Morwood, of the University of Wollongong in Australia, in collaboration with Indonesian scientists from the National Research and Development Centre for Archeology in Jakarta, may unearth an answer to the competing theories on the origins and nature of Homo floresiensis. The research for this international study was supported by grants from the Australian Research Council, the National Geographic Society, the Wenner-Gren Foundation for Antrhopological Research, the Wellcome Trust and the Leakey Foundation. 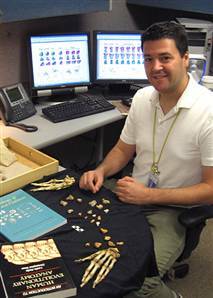 In addition to Dr. Jungers, co-authors of the study include: W. E. H. Harcout-Smith, Division of Paleontology, American Museum of Natural History; R.E. Wunderlich, Department of Biological Sciences, James Madison University; M.W. 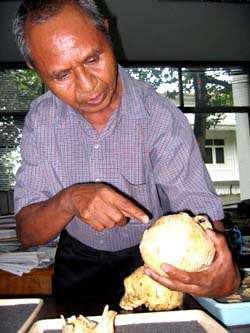 Tocheri, Department of Anthropology, Smithsonian Institution; Susan G. Larson, Department of Anatomical Sciences, Stony Brook University Medical Center; T. Sutikna and Rhokus Awe Due, of the National Research and Development Centre for Archeology, Jakarta, Indonesia, and M.J. Morwood, School of Earth and Environmental Sciences, University of Wollongong, New South Wales, Australia. The tiny, human-like creature living and using tools in Indonesia just 18 000 years ago really was a distinct species, not just a malformed modern human. That is the clear implication of a study which reports that the so-called "hobbit" had wrist bones almost identical to those found in early hominins and modern chimpanzees, and so must have diverged from the human lineage well before modern humans and Neanderthals arose. Palaeontologists have battled bitterly over the diminutive skeleton ever since its discoverers described it three years ago as a new species, Homo floresiensis. 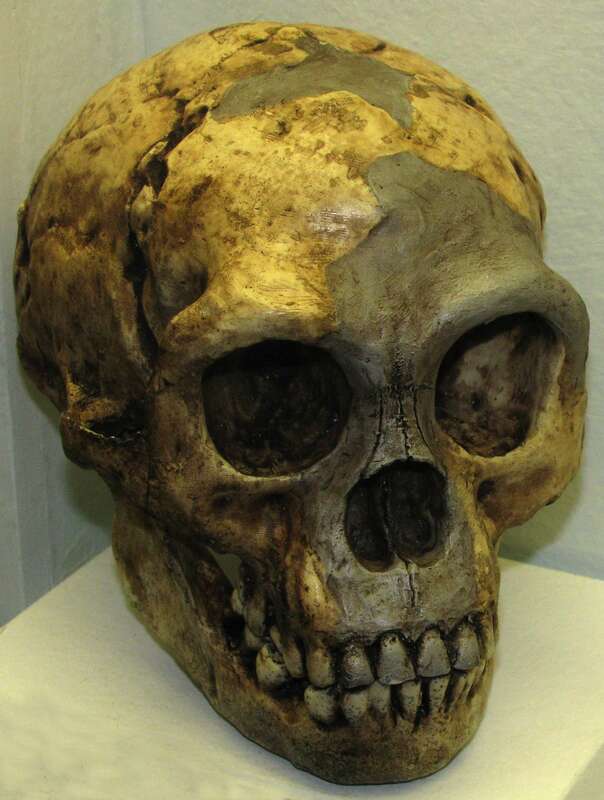 Its tiny brain simply did not fit with the current understanding of human evolution, particularly since no other hominin fossils in the last 3 million years - and none at all outside Africa - had such a small brain. This dissonance led sceptics to argue that the hobbit must be merely a modern human with some form of microcephaly. Most of the argument has centred around the skull, but much of the rest of the skeleton was excavated at the same time. When Matthew Tocheri, a palaeoanthropologist at the Smithsonian Institution in Washington DC, happened to see casts of the specimen's wrist bones, he knew they told an important story. 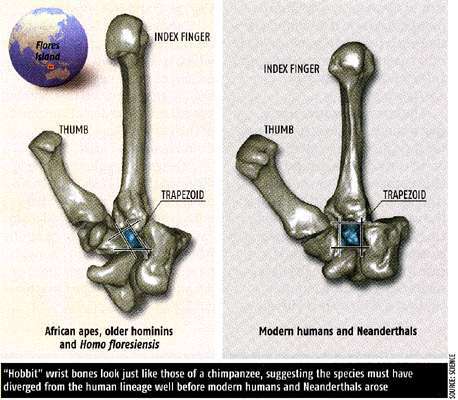 Tocheri, an expert in the evolution of the human wrist, could see right away that the hobbit's wrist bones looked just like those of a chimpanzee or an early hominin such as Australopithecus - and had none of the specialisations for grasping that are seen in the wrist bones of modern humans (see Diagram). A statistical comparison came to the same conclusion (Science, DOI: 10.1126/science.1147143). "The modern human wrist hasn't looked like this for at least 800 000 years, and maybe much longer," says Tocheri. "It was immediately apparent to me that the hobbit is the real deal." Other recent or soon-to-be published studies of the hobbit's foot bones, upper arm and shoulder also suggest that its anatomy differed from that of modern humans. "As you add these up, you do certainly get a picture of something distinct and not human," says Chris Stringer, an authority on human evolution at the Natural History Museum in London. However, Robert Martin, a primatologist at the Field Museum in Chicago who is the leading advocate of the microcephaly explanation, remains unconvinced. 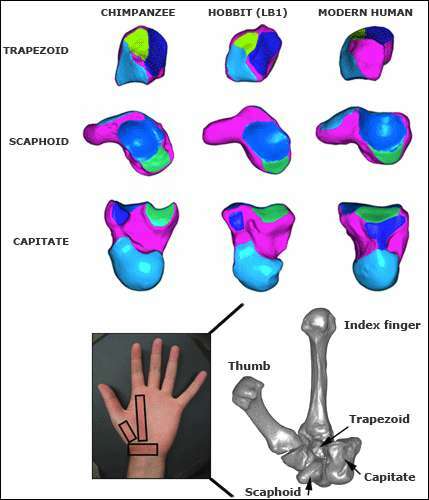 No one has studied the wrist bones of microcephalic humans, he notes, so it is pure conjecture to say they would not look like the hobbit's bones. LB1 lower limb bones. These are extremely short in comparison to the body and arms, but also thick and robust. The foot is also very long, which would have increased the length of the stride. The curved phalanges (toes) may also indicate a more arboreal lifestyle. NEWSWEEK: What's different about what was published back in 2004 and what you're publishing now? Matthew Tocheri: In 2004, when the initial reports came out, not everything had been analyzed, and they mainly focused on the skull, because that's what's generally most preserved in the fossil record. The reason this paper is catching such a storm is because it's basically coming out of left field. 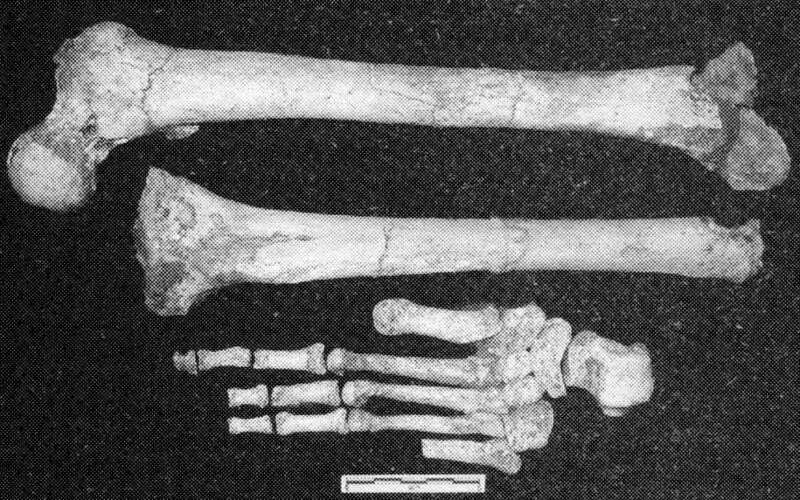 The main hobbit specimen has three wrist bones preserved, and the results are quite clear. Within our human, great-ape family tree, we've got two very different types of wrists: those of humans and those of living African apes, like chimps and bonobos and gorillas. And the hobbit wrist looks just like that of the African apes. What does this say about human evolution? It smashes the long-cherished scientific belief that our species, Homo sapiens, has had the earth to ourselves for tens of thousands of years. It makes us realize how much more complicated our recent evolutionary history is. Before the hobbit was found, we thought that for the last 30,000 years or so we've been alone in the world, and that all the other earlier hominid forms that we see in the fossil record between 1 and 3 million years ago had died out. 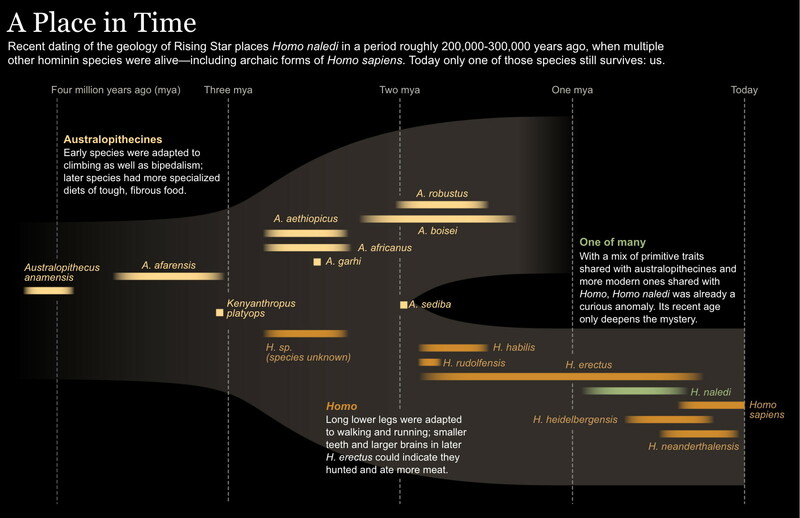 Now we know that not all of those lineages went extinct prior to 1 million years ago, and some lived all the way up to the present time. Does it also raise even more questions about where we come from? It doesn't necessarily raise questions about where we come from, but it does raise many questions about where the hobbits came from. When did the hobbit's ancestors leave Africa? How did they get all the way to Southeast Asia, and when? It looks as if this could be just the tip of the iceberg, which makes it such an exciting discovery for science. It tells us that, hey, we've got a lot of work to do. What about the argument that there could be a pathological explanation to all of this? 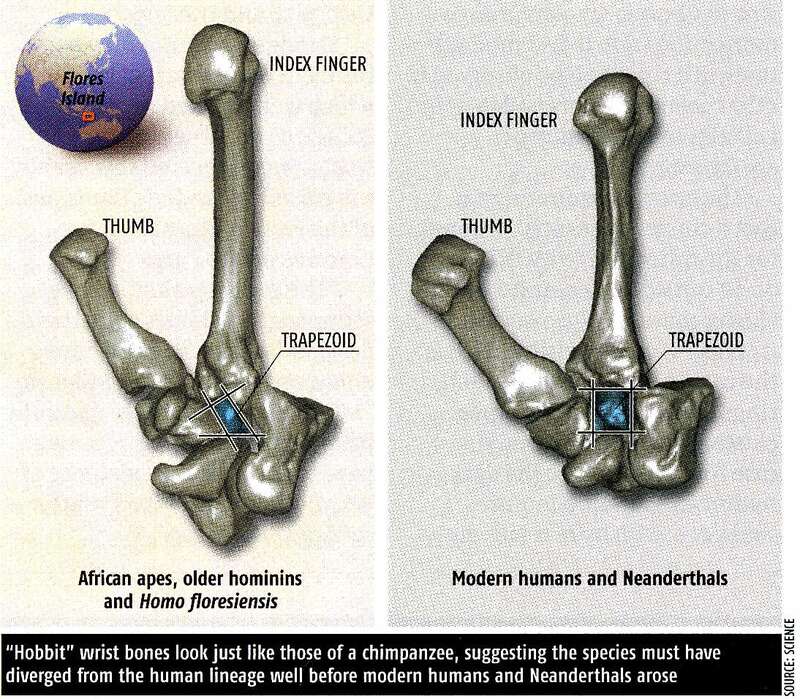 Pathology cannot adequately explain why the shape of the hobbit's [wrist] is just like what we've seen in Australopithecus, early species of Homo, and African apes. The characteristic shapes of wrist bones develop during the first trimester [of gestation], well before genes that cause growth disorders and other skeletal defects begin to express themselves. Therefore, pathology cannot explain, for example, why the hobbit's wrist is indistinguishable from that of a normal chimpanzee. But there are still skeptics, no? In this debate most people have sat somewhere in the middle, waiting for more evidence. I think what this paper does is convince all those who were undecided, people who are allowing the evidence to help make up their minds, that this is really a primitive species of human and not a modern human with some form of pathology. What was your involvement back when the hobbit was first discovered in 2003? None at all. I was an innocent bystander until about a year ago, when by accident these wrist bones basically ended up in the same room I was in. At that point I hadn't made up my mind about anything. But even without knowing what I now know, if you had shown me these wrists without any other contextual information, I'd have said it is the wrist of a small African ape or fossil hominin. They don't look anything like what the bones look like in modern humans. Flores Man's grapefruit-size brain was two-thirds smaller than ours, a size at one time thought too small for sophisticated thought. 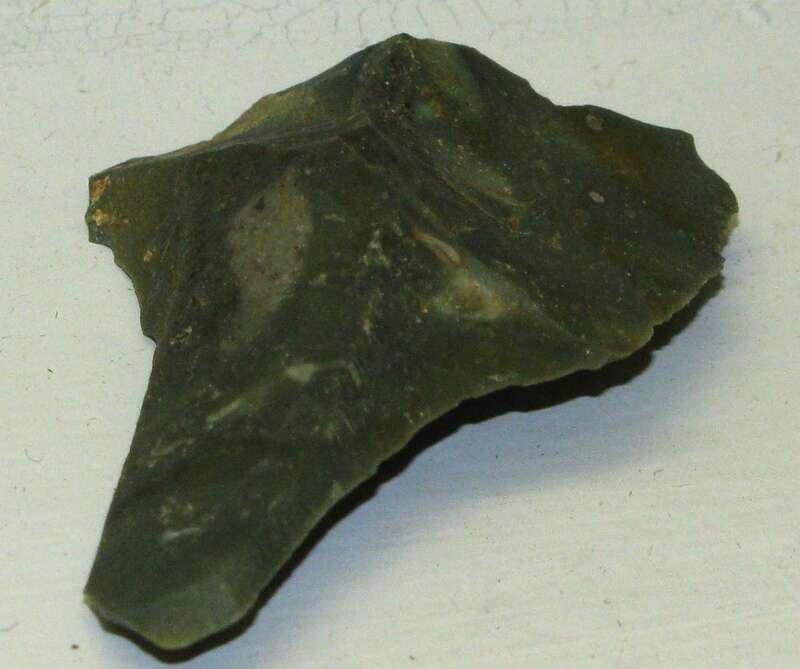 But evidence suggests that the creatures made stone tools, tended fires and organized hunts. If that's true, would it overturn scientific axioms about the relationship of brain size to intelligence? There's never been a skull that small in the genus Homo. It's basically equivalent to a chimp or Australopithecine [an apelike hominin closely related to humans]. And that small brain size creates a problem, because we thought that once the brain size started getting big, all the other hominin species with smaller brains went extinct. 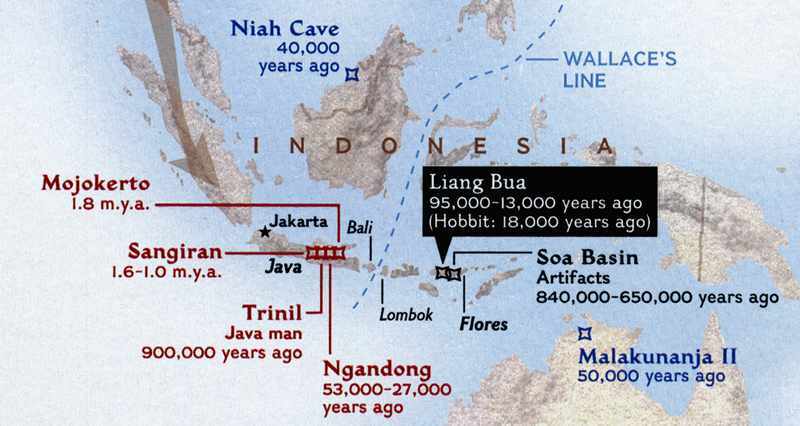 But these hobbits not only made it out of Africa but across Asia to a small, remote Indonesian island. How they did it and when they did it—these are questions we now have to solve. But it definitely tells us that big brains may not be everything about the story. All the parts of the skeletal anatomy need to be explored. What does this discovery say about Africa holding or not holding the answers to how and where we came to be? Could there be other types of people who lived? Africa is still the most likely place of our ancestry, but that doesn't mean that different types of hominins didn't get out of Africa earlier than we previously thought. We've always known that there are other types of hominins, but the hobbits tell us that there are other types that have lived almost up until today. So all of a sudden certain places that may not have been interesting [for excavation] because their sediments weren't old enough, now are. Hobbits are opening up a whole lot of doors, telling us that the next 50 years or so are going to be very exciting in human origins research. Is it going to make the picture complicated? Yes. But it's going to result in good science in the long run, and it's going to be tremendously exciting. To do more excavations on Flores and the islands surrounding it, as well as more detailed analyses on the fossils we have. We've got a whole lot of looking and studying to do. Dental work on the Hobbit? Hobbit Watch: Did the hobbit have a root canal? 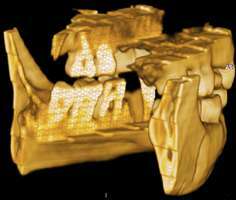 Hobbit skeptic Maciej Henneberg is proposing that the skeleton known as LB1 — the most complete hobbit by far — appears on the basis of photographs to have had a filling, possibly a root canal, in its lower left first molar (the M1). If true, this would mean the hobbit is a modern human, not a new species, which is the minority viewpoint that Henneberg and his colleagues have been arguing all along. Henneberg showed a series of photographs that appear to support his argument. He made the observations in 2005, but was waiting to get access to the original bones so that he can verify what he thinks he sees in the photos before publishing his theory. Because he doubts that he will receive permission to examine the remains, however, he is now circulating his idea. Suffice it to say, I was eager to hear how other hobbit researchers would respond. Both sides tend to be dismissive of each other's work, so I expected there would be strong words from the hobbit defenders. And there were. But they backed up their position with CT scans and photographs. "The photograph of the occlusal surface shows there is no filling. There are no dental materials or dentists who can color match and hide a cavity in a molar to the degree that would be necessary. Why would anyone want to, even if possible. Certainly not with the dental amalgam which was all that was available until fairly recently." Next up is the CT scan, in which the normal, bifurcating roots of the M1 are visible. According to Brown, "…the CT scans when combined with the detailed occlusal view, totally refute Henneberg's claim." "We think that it is highly unlikely that any type of filling material is in the mandibular left first molar. The defect in the mandibular left first molar does not have the appearance of a cavity preparation made by a dentist in that the defect is shallow, is non-retentive, and is not extended in an apical direction interproximally. There is no indication of tooth decay in any of LB1’s teeth. Silver amalgam fillings were present in the 1930s, and if a dentist were to place a filling in a tooth, it would seem most likely that it would be a silver amalgam. If for some reason, a temporary filling were placed in LB1’s mandibular left first molar, we should be able to see some indication of it in the CT images, but we cannot—all that we can see is a defect that resembles other defects on LB1’s teeth where the enamel has worn away and the dentine is exposed." An edited version of the excellent blog by John Hawks, a very highly respected paleoanthropologist. ....So, does the claim have any merit? That's the part that drives me crazy. So much of this whole thing has been framed like a court of inquiry, with lawyer-like arguments about the published record. That's not how science is supposed to work. For any other skeleton in the world, this claim would be extraordinarily simple and easy to test -- just look at the specimen, scrape at the supposed filling with a dental pick, and see what it is made of: dentin or dental cement? Or, look at a lateral radiograph. Unfortunately, requests for access to the specimen to test the hypothesis have been denied. And no decent radiograph has emerged. 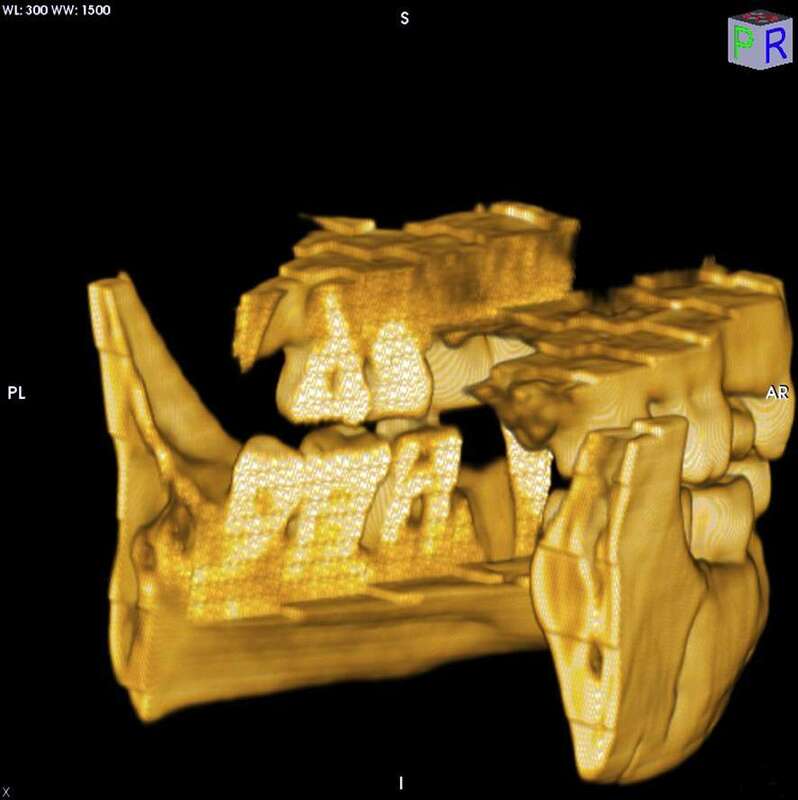 In Kate Wong's article, Peter Brown has provided a CT image with a section of the left lower dentition. But the section appears insufficient to answer the question -- it has rather poor resolution (typical of medical CT scans), and cuts through the lingual cusps of the lower M1, not the buccal (cheek) cusps which appear to have been most affected by the irregularity. I saw Maciej's pictures of the specimen and listened carefully to his line of reasoning. To be very clear, my opinion has very little value on this question: I've seen a lot of teeth, but I'm no dental anthropologist. At least one dental anthropologist I spoke to thought that the specimen was a fairly unproblematic broken tooth. Others have said it was consistent with drilling. Everybody I've talked to thinks that ultimately the question can only be settled with radiographs or direct observations. The buccal enamel wall has an unusual, straight-edge discontinuity on the crown, and is raised by ca. 1.5-2 mm above the center of the tooth. The mesial enamel wall is broken away, and a whitish, flat, pitted surface characterizes most of the occlusal face, except for the enamel walls and the disto-lingual corner. This contrasts with the wear pattern on the antimere right lower M1, which has normal dentin exposure at the cusps, and the whitish color contasts with the dentin exposure of the other teeth -- although color may have no value given the uncertainty of photographs and the application of a chemical preservative to the specimen. The lower molars are asymmetrically worn, with much more wear on the lower right teeth than the lower left ones. This would appear consistent with the individual chewing much more heavily on the right side than the left for some time prior to death. The alveoli around many of the molars appear eroded, and a small caries appears on the left upper M1, in the region occluding with the lower left M1. The lower left P4 is absent postmortem, and its alveolus also appears eroded. These observations would all be consistent with spreading periodontal disease resulting from an initial large caries in the lower left M1. Henneberg relays that his colleague Etty Indriati has looked into government records concerning the dental practices on Flores and other rural parts of Indonesia. According to Maciej, the government recommended a certain dental cement rather than amalgam fillings -- even though the cement does not last forever, it was much cheaper than preparing more permanent fillings and took less time to prepare. This cement does not contain metal like amalgam fillings, and might therefore escape detection in a superficial examination. The CT image appears to show a normal-looking pulp cavity (or at least one with high contrast with surrounding material) in the lingual part of the tooth. That weighs against the idea of an extensive filling, but more detail in that region would be helpful. What is essential is to get a better assessment of the remains themselves. I try to approach all of this stuff skeptically. The tooth is unusual, but there are ways that it might break naturally in the observed pattern. A premortem break or periodontal disease might cause asymmetrical wear by themselves. Preservative has been applied to the tooth's surface, making photographs misleading. And several skilled osteologists (including one dentist) examined the remains without noticing anything strange enough to scrape the tooth with a dental pick. All those things weigh against the hypothesis that this tooth has had dental work. And yet, there is something unusual about it, and this hypothesis should be absolutely trivial to test. The CT scan may be enough, although with its resolution I would guess that a radiograph may be more convincing. A simple look at the specimen would be enough. Or a direct radiocarbon date -- which despite the sampling of collagen for DNA testing, was never performed. So, I would like to see the radiograph. The LB1 cranium and mandible in lateral and three-quarter views, and cranium in frontal, posterior, superior and inferior views. Scalebar, 1cm. 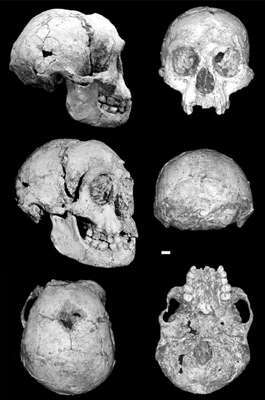 Homo floresiensis in the context of the evolution and dispersal of the genus Homo. a) The new species as part of the Asian dispersals of the descendants of H. ergaster and H. erectus, with an outline of the descent of other Homo species provided for context. b) The evolutionary history of Homo is becoming increasingly complex as new species are discovered. Homo floresiensis (left) is believed to be a long-term, isolated descendant of Javanese H. erectus, but it could be a recent divergence. Solid lines show probable evolutionary relationships; dashed lines, possible alternatives. Flores Man adds an interesting twist to our hominid phylogenies. As you can see in this diagram, we now have to add this slender thread from the great Homo erectus dispersal, a relic species that survived long after its closest relatives. 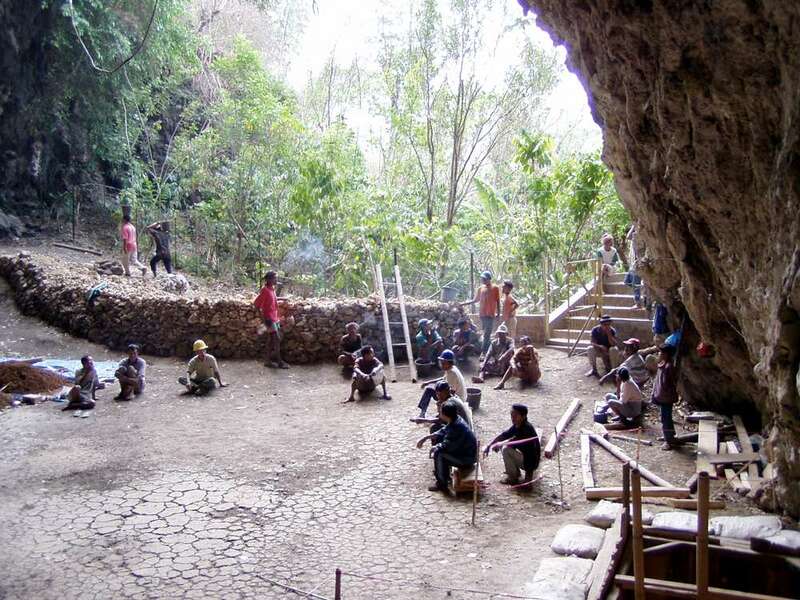 Researchers from the University of New England have uncovered new evidence of toolmaking by early hominids on the Indonesian island of Flores. The find appears to put paid to claims Homo floresiensis, the diminutive species of hominid discovered on Flores in 2003, lacked the brain power to produce sophisticated stone tools. In 2005, American archaeologists argued in the Washington Post that stone tools found alongside Homo floresiensis skeletons on Flores could only have been made by modern humans. Now a team of Australian and Indonesian archaeologists have discovered near-identical tools at a site nearby. 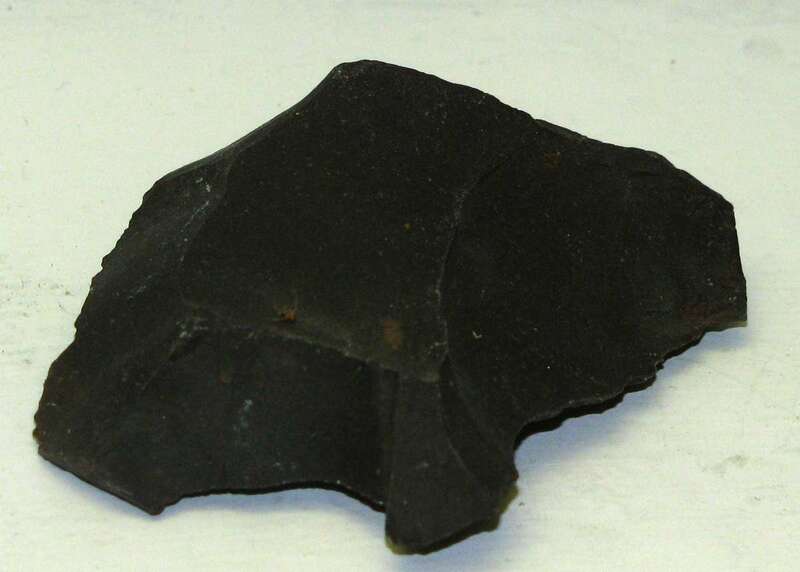 These tools were shaped about 850 000 years ago, making them four times older than the oldest known modern humans. No skeletons were found with the tools, making it impossible to say for sure who made them, but the scientists' best guess is that they were made by ancestors of Homo floresiensis, themselves probably descendents of Homo erectus. The discovery and its implications are described in an article to be published in Nature magazine today. "There are amazing similarities between these tools and those found at Liang Bua," said Mark Moore, a Postdoctoral Research Fellow at the University of New England and one of eight co-authors of the Nature article. "They look just like you would expect if they had been made by Homo floresiensis." A total of 487 stone tools were found at Mata Menge, about 50km east of Liang Bua where the original Homo floresiensis skeletons were found. The find throws added weight behind Homo floresiensis' claim to a unique place in the human family. Since the skeletons were unearthed in 2003, scientists have been arguing over whether the remains were of a unique human species or a diseased population of modern humans. Those clinging to the "microcephalic" theory claim the stone tools found at Liang Bua were much too sophisticated to have been made by small-brained Homo floresiensis and could therefore only have been made by modern humans. "This find knocks the support out from under that line of argument," Dr Moore said. "These tools have been fission-track dated to 840 000 years ago. Modern humans didn't appear until 200 000 years ago. So there's no way they were made by modern humans. If not by them, then by whom? Our theory is the ancestors of Homo floresiensis." The discovery was the result of extensive collaboration between Indonesian and Australian scientists. The excavation at Mata Menge was planned and directed by Dr Fachroel Aziz of the Geological Research and Development Centre, Bandung, in association with UNE’s Professor Mike Morwood. Mark Moore analysed the Liang Bua tools and assisted with the analysis of the Mata Menge tools. They were aided by scientists from the University of Wollongong, the Australian National University and the National Museum of Natural History in the Netherlands. 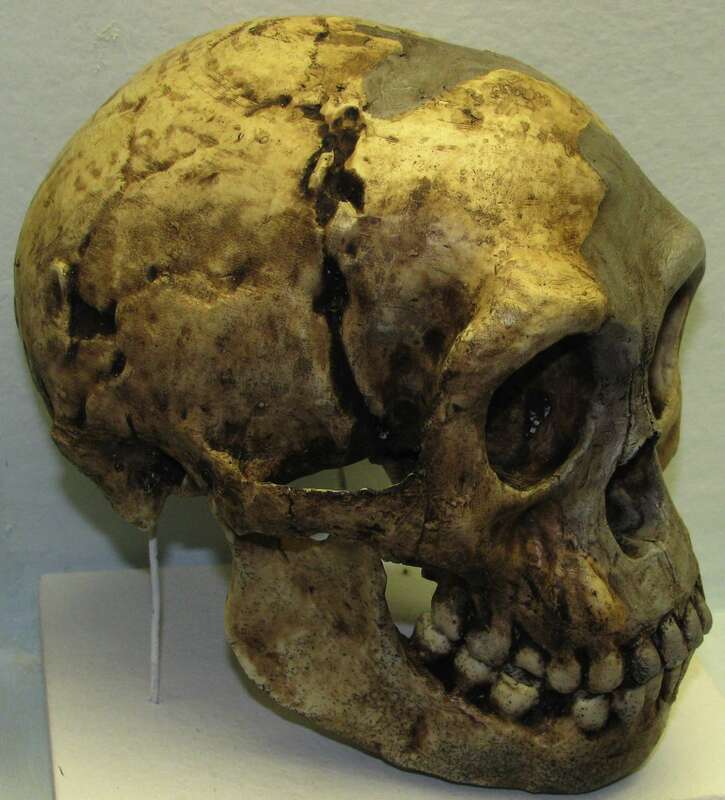 Scientist Rokus Awe Due shows the skull of Homo floresiensis. Currently, it is widely accepted that only one hominin genus, Homo, was present in Pleistocene Asia, represented by two species, Homo erectus and Homo sapiens. Both species are characterized by greater brain size, increased body height and smaller teeth relative to Pliocene Australopithecus in Africa. Here we report the discovery, from the Late Pleistocene of Flores, Indonesia, of an adult hominin with stature and endocranial volume approximating 1m and 380 cm3, respectively - equal to the smallest-known australopithecines. The combination of primitive and derived features assigns this hominin to a new species, Homo floresiensis. The most likely explanation for its existence on Flores is long-term isolation, with subsequent endemic dwarfing, of an ancestral H. erectus population. Importantly, H. floresiensis shows that the genus Homo is morphologically more varied and flexible in its adaptive responses than previously thought. the text below except where otherwise noted is adapted from this article in Nature. 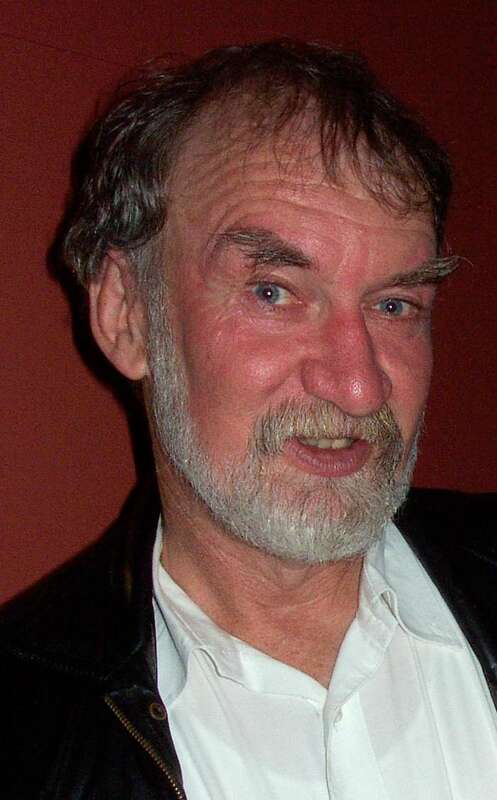 Peter Brown, one of the leading researchers involved in the find. 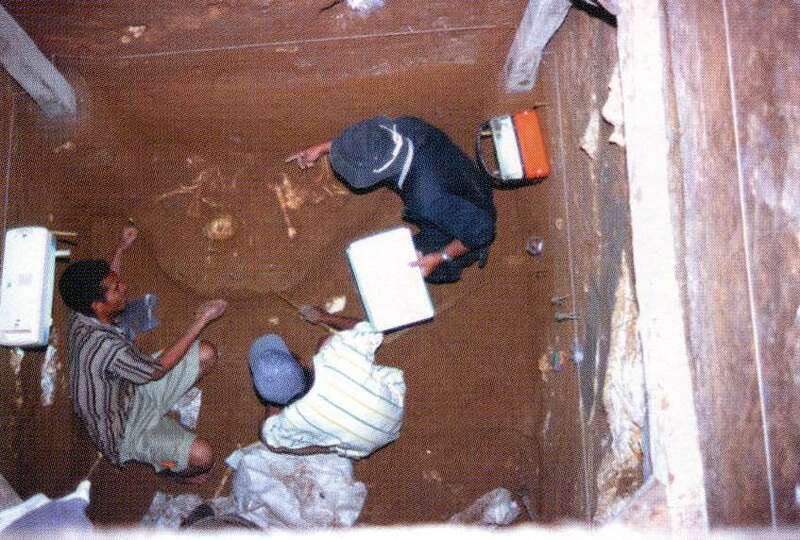 The scientific party was excavating at a cave called Liang Bua which means "cool cave". It was cool because it was always shaded, and the walls were moist pretty much all the time. It is physically a very large and commodious cave, still used to the present day. LB1 skeleton in situ on 8 August 2003. Parts were still articulated, indicating that the corpse was quickly covered with sediment while still partially fleshed. Local staff were invaluable in the recovery of the specimens. 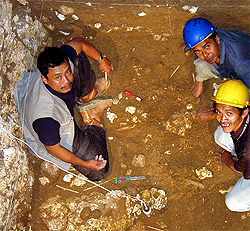 The LB1 skeleton was recovered in September 2003 during archaeological excavation at Liang Bua, Flores. Most of the skeletal elements for LB1 were found in a small area, approximately 500 cm2, with parts of the skeleton still articulated and the tibiae flexed under the femora. Orientation of the skeleton in relation to site stratigraphy suggests that the body had moved slightly down slope before being covered with sediment. The skeleton is extremely fragile and not fossilized or covered with calcium carbonate. 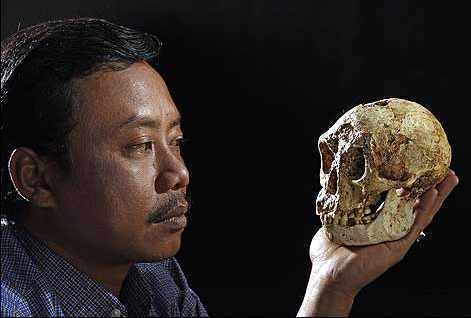 Thomas Sutikna of the Indonesian Centre for Archaeology in Jakarta, Indonesia, holds a skull that he and fellow scientists believe represents a new human species, Homo floresiensis. 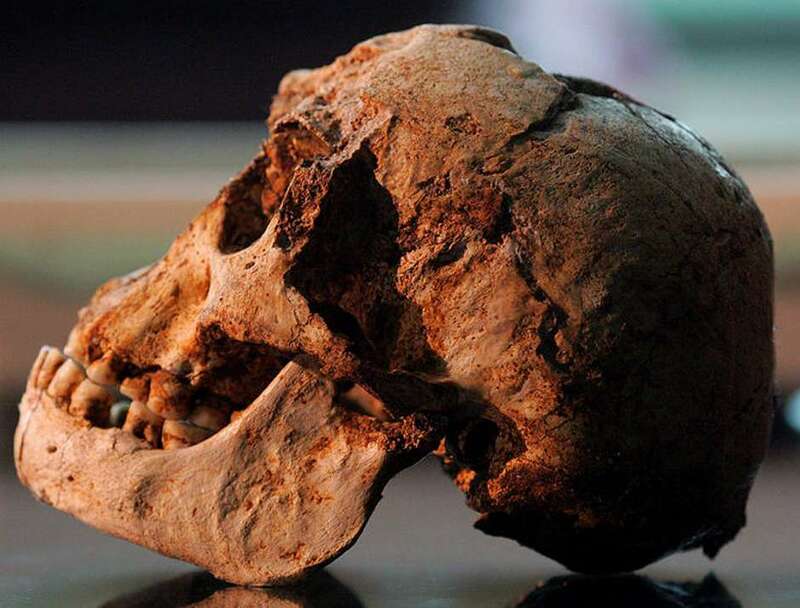 The 18,000-year-old skull was found in October in a cave on the Indonesian island of Flores. Recovered elements include a fairly complete cranium and mandible, right leg and left innominate. Bones of the left leg, hands and feet are less complete, while the vertebral column, sacrum, scapulae, clavicles and ribs are only represented by fragments. The position of the skeleton suggests that the arms are still in the wall of the excavation, and may be recovered in the future. Tooth eruption, epiphyseal union and tooth wear indicate an adult, and pelvic anatomy strongly supports the skeleton being that of a female. On the basis of its unique combination of primitive and derived features we assign this skeleton to a new species, Homo floresiensis. Mike Morwood has a distinguished career in archaeology, and his book Visions from the Past: the archaeology of Australian Aboriginal art is a definitive text. He directed the Liang Bua dig. The LB1 partial adult skeleton was excavated in September 2003. Recovered skeletal elements include the cranium and mandible, femora, tibiae, fibulae and patellae, partial pelvis, incomplete hands and feet, and fragments of vertebrae, sacrum, ribs, scapulae and clavicles. Liang Bua is a limestone cave on Flores, in eastern Indonesia. The cave is located 14 km north of Ruteng, the provincial capital of Manggarai Province, at an altitude of 500m above sea level and 25 km from the north coast. It occurs at the base of a limestone hill, on the southern edge of the Wae Racang river valley. The type locality is at 08° 31' 50.4" south latitude 120° 26' 36.9" east longitude. Plan of Liang Bua showing location of excavated areas. 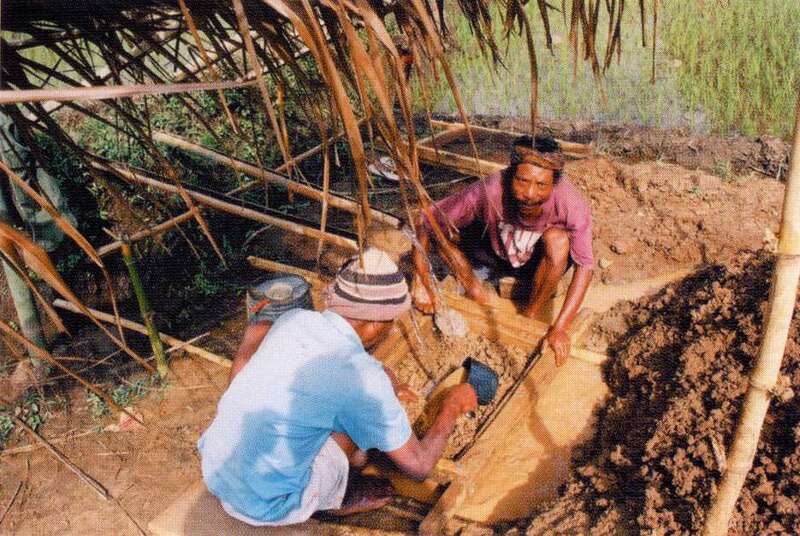 Between 1978 and 1989 Soejono excavated Sectors I to X, but only to a maximum depth of 4.25 metres. 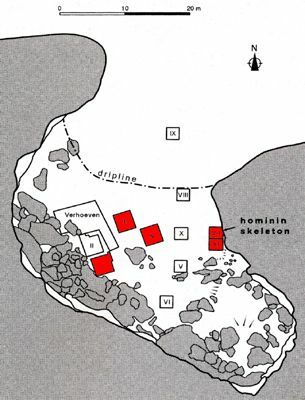 The team continued the excavations in Sectors I, III, IV and VII, and began a new Sector, XI, (all shown in red on the plan) to reach a maximum depth of 11 metres. Bedrock has still not been encountered in any of the excavated areas. Wet-sieving deposits excavated from Liang Bua in 2004 by Gaba Gaur and Rius Laru. 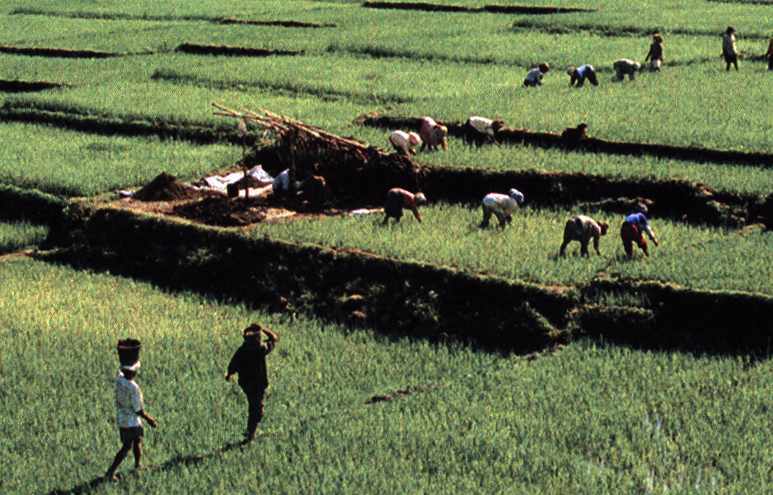 This system, designed by the Manggari, used bamboo pipes to bring water to a dry area surrounded by paddy fields. Father Theodor Verhoeven carried out the firstlarge-scale work at the site in 1965, and R. P. Soejono excavated ten Sectors between1978 and 1989. Beginning in 2001, we extended the excavations in Sectors I, III, IV and VII. The type specimen LB1 was found at a depth of 5.9m in Sector VII of the excavation at Liang Bua. It is associated with calibrated accelerator mass spectrometry (AMS) dates of approximately 18 kyr and bracketed by luminescence dates of 35 ± 4 kyr and 14 ± 2 kyr. The referred isolated left P3 (LB2) was recovered just below a discomformity at 4.7min Sector IV, and bracketed by a U-series date of 37.7 ± 0.2 kyr on flowstone, and 20 cm above an electron-spin resonance (ESR)/U-series date of 74 (+14 -12) kyr on a Stegodon molar. End of text from Nature Article. A painting of a male Homo floresiensis. The story of man is being rewritten. Australian and Indonesian scientists have dug up skeletons of a previously unknown human species - real "hobbits" that stood only a metre tall - that lived on the Indonesian island of Flores, west of Timor, until relatively recently. 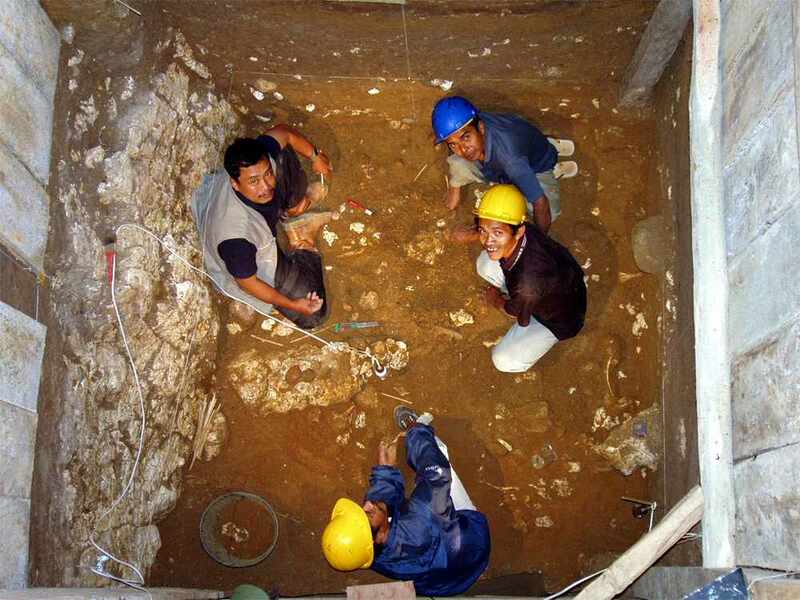 The scientists found the first skeleton in September 2003 in Liang Bua, a large limestone cave on the island. The one-metre-tall female, aged about 30 and dubbed "Hobbit", lived about 18 000 years ago. Six similar skeletons were later found, some of whom lived in the cave just 13 000 years ago. The scientists have speculated that the species may have lived on Flores - which they dubbed the "lost world" - until the 16th century. They were dark and hairless with sunken eyes, a flat nose, large teeth, a projecting mouth and no chin. Despite having a small brain, the species could cook, hunt large prey and build rafts, the scientists say. 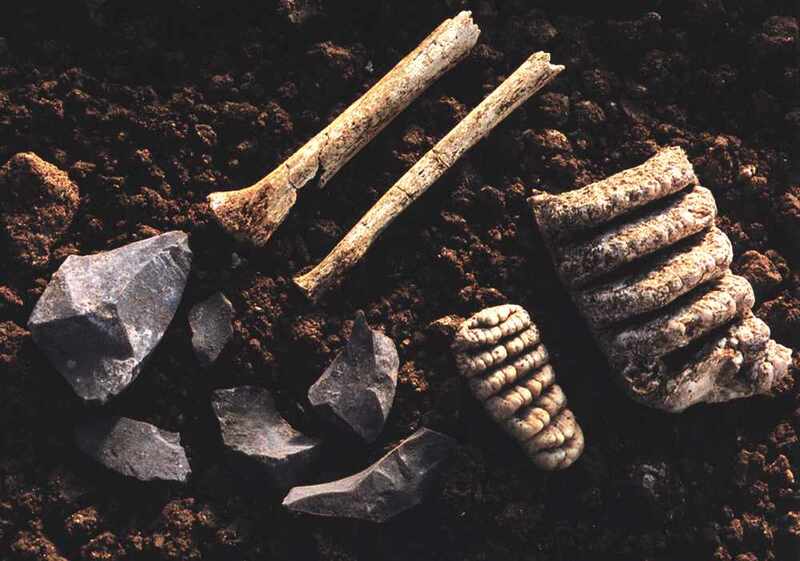 Stone artefacts and animal remains were found with the skeletons. The new species has been officially named Homo floresiensis, and it is the most recent living human relative by far: until this week, the only other human species known to have coexisted with modern humans (Homo sapiens) were Neanderthal man and Homo erectus. Neanderthal man lived in Europe, becoming extinct 30 000 years ago. Homo erectus lived in Asia, becoming extinct possibly 100 000 years ago, although this figure is disputed. The discovery is published in this week's edition of Nature. One of the scientists and a co-author of the Nature paper, Bert Roberts from the University of Wollongong, told The Age the team was stunned by the discovery. "It's come out of left field," he said. "No one was predicting this. It's one of those big leaps forward as opposed to the incremental advances we make most of the time. "We were expecting to find the remains of early modern humans. Instead, what we found is a completely new species of human." Professor Roberts said the discovery would redraw the human family tree. "It's one of the most important (discoveries) because it shows there was diversity among humans until very, very recently. If you go with the previous models, people say for the past 30 000 years we've been the only human species to inhabit the planet, whereas in fact that's rubbish. "For most of human history, there's been more than one human species. Right now, it's unusual for us to be the only one around. In actual fact, that's been the case even more recently than we ever believed possible." "They've got a brain the size of a grapefruit, yet they can make stone tools just as well as we can make them . . . they were cooking, they were making fire and they were hunting those little stegodons, those little baby elephants . . . they were intelligent and almost certainly had language." The Liang Bua cave was inhabited from 95 000 years ago, he said, but archaeological evidence indicated that the species arrived on Flores hundreds of thousands of years before. They would have needed rafts to get to the island, but they were probably much bigger than they later became - genetic isolation over the millenniums causing them to shrink. The scientists have dismissed the possibility that they found children or dwarfs and say the skeletons are those of fully grown adults. By contrast, pygmies - the shortest members of Homo sapiens - are about 1.3 metres tall. The excavation team was led by Peter Brown and Mike Morwood from the University of New England and included scientists from the Indonesian Centre for Archaeology. A major unresolved question is whether the new species shared Flores with Homo sapiens. Homo sapiens left Africa about 100 000 years ago and had reached Australia, south-east of Flores, about 50 000 years ago. Professor Roberts said a layer of volcanic ash at the site suggested a volcanic eruption killed the species 12 000 years ago. But they may have survived elsewhere on the island. "There are lots of local folk tales in Flores about these people which are consistent and incredibly detailed. The stories suggest there may have been a grain of truth to the idea they were still living on Flores up until the Dutch arrived in the 1500s," Professor Roberts said. "The stories suggest they lived in caves. The villagers would leave gourds with food out for them to eat, but legend has it they were the guests from hell - they'd eat everything, including the gourds." He said isolated Flores was a fascinating "lost world", home to a range of exotic creatures extinct elsewhere, often morphed into giant or dwarf forms through lack of genetic diversity. These included a dwarf form of the primitive elephant stegodon, giant rats, Komodo dragons, and even larger species of giant lizard. The scientists say Homo floresiensis is descended from Homo erectus, who first arrived on Flores about 840 000 years ago, after leaving Africa about a million years ago. However, Colin Groves, of the Australian National University, said the skeletons had some extremely primitive features, and could be related to an even earlier human ancestor, Australopithecus, which predated all Homo species and was thought not to have left Africa. Professor Groves, who was not involved in the discovery, called it "very significant . . . absolutely fascinating". 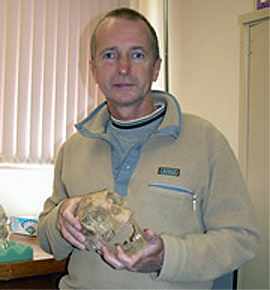 Alan Thorne, also from the ANU, predicted a worldwide storm of controversy over the skeletons, especially with regard to their exact ancestry. Professor Roberts said the team would continue to dig on Flores and other isolated Indonesian islands to see if other human species existed and whether Homo sapiens may have lived alongside them. "It's a real lost world . . . until so recently there would have been these tiny little people running around," he said. "It would have been fantastic to see." 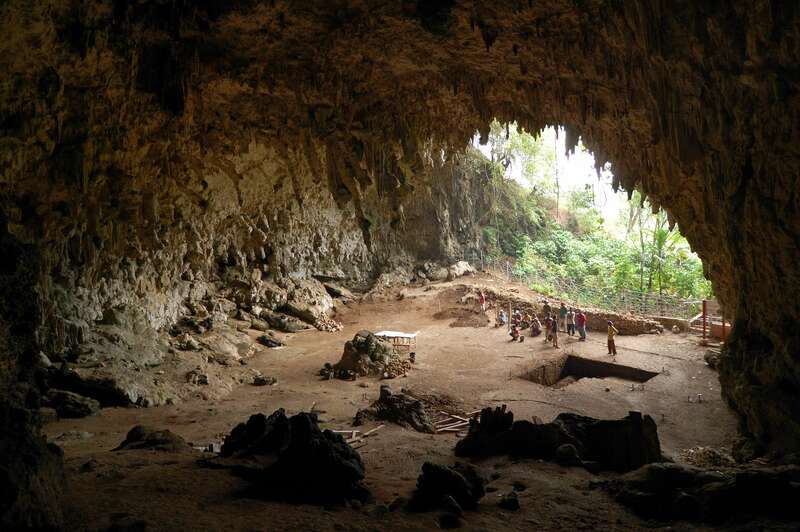 The hobbit-sized humans who lived on the remote Indonesian island of Flores until 12 000 years ago may have had a very ancient family history. A new study of bones from more members of the tiny species suggests they descended from an unknown primitive ancestor related to australopithecines like "Lucy", who lived 3 million years ago in Ethiopia. This would mean human-like creatures must have left Africa much earlier than thought - almost 2 million years ago. Australian and Indonesian scientists stunned the world a year ago with their discovery in a cave on Flores of the skull and partial skeleton of a new kind of human, dubbed hobbit, who was about a metre tall with a brain the size of a chimpanzee's. "We now have evidence for at least nine individuals," the research team leader, Mike Morwood, of the University of New England, said yesterday. Independent scientists who were not members of the discovery team said the latest analysis of the finds, described today in the journal Nature , confirmed the hobbits, Homo floresiensis , belonged to a new species of humans, and were not merely pygmies or diseased modern humans, as a small number of sceptics have claimed. "This clinches it 100 per cent," said Dr Colin Groves, of the Australian National University. Daniel Lieberman, of Harvard University, said excavations in Liang Bua cave showed it had been inhabited for more than 80,000 years by people hunting pygmy elephants, making stone tools and using fire. If they were just small, modern humans with brain deformities, they would have had to survive for a very long time. "Such possibilities strain credulity," Professor Lieberman said. Peter Brown, a member of the team from the University of New England, said the newly described remains, which included a second jaw, the right arm of the original skeleton and other leg and arm bones, showed some of the adults were even less than a metre tall. 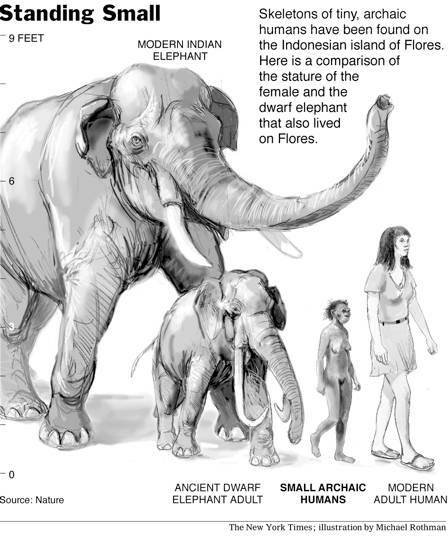 The team had initially thought the hobbits had descended from a more recent human ancestor, Homo erectus , who underwent a dwarfing process on the island similar to the pygmy elephants. "But increasingly the evidence is pointing towards an ancestor with the same body size and brain size as australopithecines ," Professor Brown said. With long arms, thick bones and small brains, these people had body proportions "exactly the same as Lucy's". The new fossils were found last year, but the researchers were unable to dig in Liang Bua this year following a custody dispute with a leading Indonesian researcher over the priceless remains, which resulted in them being irreparably damaged. 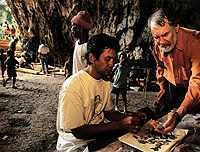 Instead, Professor Morwood and his colleagues excavated in the nearby Soa Basin and found "very exciting" evidence, including stone tools that pushed back the known human occupation of the island to at least 1 million years. Text below adapted from an article in National Geographic, April 2005: At first we thought it was a child, perhaps three years old. But a closer look showed that the tiny, fragile bones we has just laid bare in a spacious cave on the Indonesian island of Flores belonged to a full-grown adult just over three feet (one metre) tall. This tiny human relative, whom we nicknamed Hobbit, lived just 18 000 years ago, at time when modern humans - people like us - were on the march around the globe. Yet it looked more like a diminutive version of human ancestors a hundred times older, from the other end of asia. (Homo erectus). 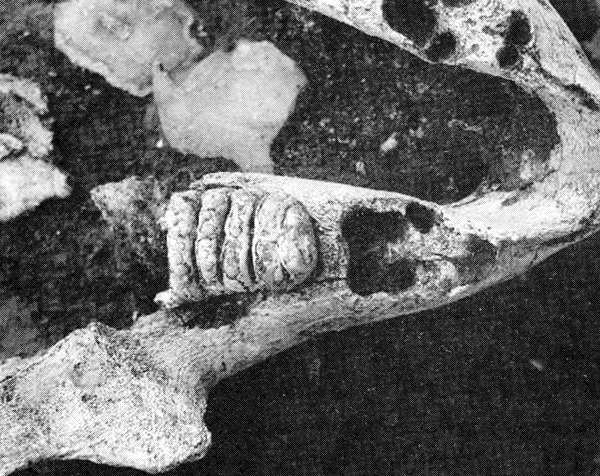 Close-up of a juvenile Stegodon jaw as excavated in Sector VII of Liang Bua. 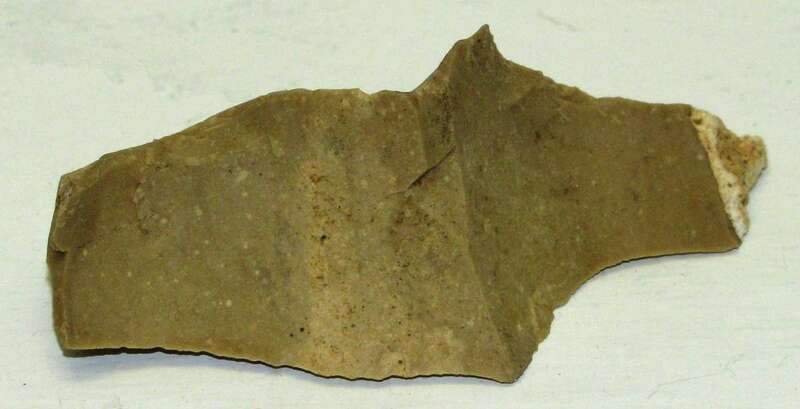 The stone artefacts were actually found within the arch of the jaw. 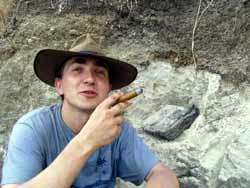 Chris Turney enjoying a cigar at Mata Menge (Flores), site of the earliest human arrival on Flores at around 840 000 years ago. a newly developed acid-base-wet oxidation pretreatment with stepped combustion (ABOX-SC) system with backgrounds in excess of 60 000 years ago. Such a system has enormous potential for archaeological and environmental scientists working at the conventional limit of radiocarbon dating. An ultra-clean 14C line has been constructed at the University of Wollongong and is being used to undertake systematic measurements of 14C within 'ancient' charcoal and fossil samples from Australia. Analyses of samples known to be radiocarbon 'dead' indicate that ages of up to 60 000 years can be reliably obtained. In collaboration with Australian and Asian colleagues, 14C ages using ABOX-SC are now being determined from early settlement sites in Australia and Southeast Asia to develop a comprehensive test of the timing of migration and colonisation of modern hominins into Australia. These results include the recent discovery of the pygmy-sized and ancient human species Homo floresiensis (the Hobbit) at Liang Bua, Flores. The ABOX-SC system was used to undertake the principal radiocarbon dating of the charcoal associated with the skeletal remains. The last of the remains were covered by a thick rhyolitic ash unit which appears to have caused the Hobbit's extinction and has now been geochemically analysed. The volcanic source is currently being investigated. 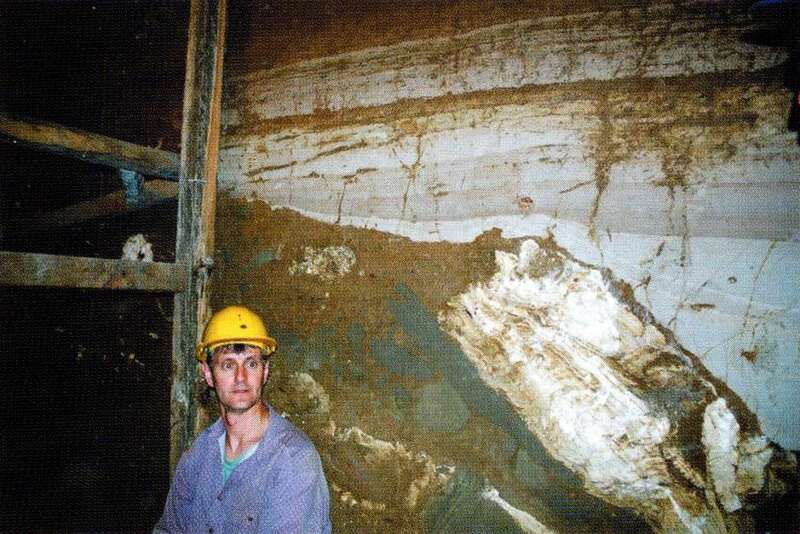 Bert Roberts and the 11 000 year old White Tuffaceous Silts in sector VII of the Liang Bua excavation. The remains of Stegodon and Homo floresiensis were subsequently found below these silts. Skeletal and diagnostic behavioural evidence for modern humans was only found above.